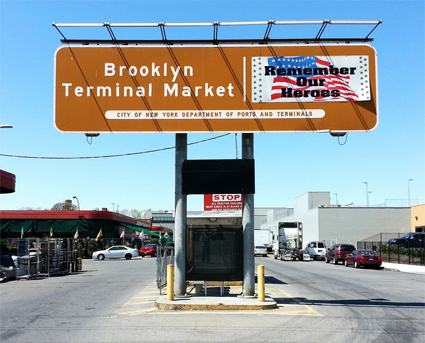 Dedicated by the late Mayor Fiorella LaGuardia, the Brooklyn Terminal Market opened for business in 1942. Located on Foster Avenue between East 83 and East 87 streets, the market has earned a fabulous reputation for offering excellent quality at great prices. In fact, after 66 years of both retail and wholesale business, the Brooklyn Terminal Mark had virtually become a Canarsie Landmark. Those new to the area can come down to the fully rented market and discover the wonderful array of products available from more than 33 individual vendors. They can experience the hustle and bustle of this lively market where the fragrance of exotic flowers and plants mingle with the scent of fresh fruit and vegetables, both domestic and imported. Come find an enormous selection of grocery items and an extensive assortment of Caribbean and West Indian products, spices from all over the world, wine grapes, beer, soda, dairy products and all types of paper goods. Before the holidays the market is bursting with every seasonable item imaginable – everything from Halloween decorations and pumpkins, to Christmas trees, wreaths and ornaments to Easter baskets and bunnies to Mother’s Day planters and bouquets. For any occasion you can find a cornucopia of delights. Visit the terminal market now and you’ll see it magnificently decorated for the upcoming holidays. Bring the family, take a walk around and enjoy the visual splendor of the market during the holidays. For a break from your shopping, and something delicious for your palate, a new restaurant is scheduled to open this month. To all our new neighbors we are looking forward to meeting you and having the pleasure of serving you. To all our old friends, we thank you for you’re past patronage and look forward to seeing you soon. The market is open seven days a week from 4:00 AM to 6:00 PM, with extra shopping hours til 8:00 PM during the holidays on Thursday, Friday and Saturday. For further information call 718-444-5700. *Terminal Market: A central site, often in a metropolitan area, that serves as an assembly and trading place for agricultural commodities. Terminal markets are usually at or near major transportation hubs.